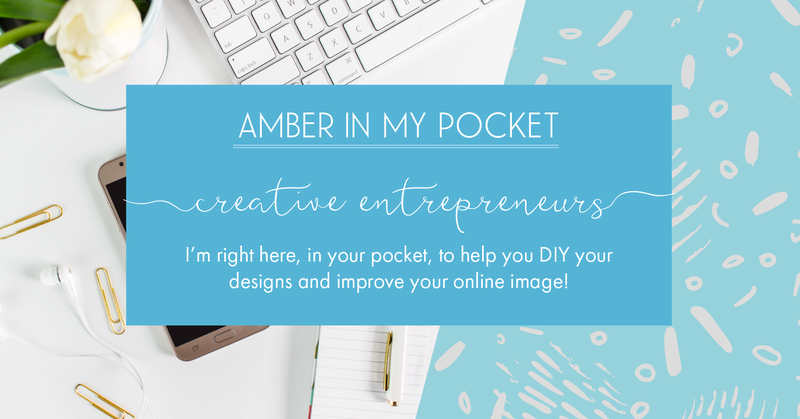 I’m Amber and I am passionate about helping small businesses create a professional online brand personality that stands out from the crowd and generates an income that gives them the freedom to live life on their own terms. I am a website designer and I help creative entrepreneurs to get a brilliant website and branding that show the world who they are, what they do and how amazing their business is so that they can get more sales and earn more money to live their dream life. I’ve always wanted to do something creative with my life. My mum was a designer at More magazine, which was quite a big magazine in the UK, and so I was taught elements of graphic design even when I was a child! I’d always have beautifully designed school projects and think carefully about the layout, colours and typography for all my work. I decided from a young age that I wanted to go into graphic design as my career but when I told my careers advisor at school that I wanted to do this without going to university (and accumulating tons of debt! ), she laughed! I decided to prove her wrong. I worked hard in my A Level Art & Design and Photography, took extra courses in design, and began an apprenticeship in marketing and design which I passed with flying colours. I was hired as a designer and campaign manager after my apprenticeship where I learned how to design and build websites as well as gaining experience working on print and branding projects. While working with this agency, I got the opportunity to work with Scottish Power, Talk Talk, The National Trust and RSPB, among other massive companies. Eventually I got bored of the corporate life. I’d always imagined a design job to be fun and free, not grey and dull. I was getting paid little money for a very demanding job and I was told by my boss that I’d only get places if I worked for the ‘big boys’. I had a natural born talent but people had always told me what path I should take. Instead of being creative and free with my work, I was depressed and trapped, wondering whether this was as exciting as my career would get. I’m very ambitious and I have massive dreams, and it hit me that maybe I’d grown up in a Disney fueled world where happiness like that doesn’t exist! It was only when I confided in family that they encouraged me to start up on my own. I handed in my notice at my job the very next day which was followed by a month of ‘you’ve made the wrong decision’ and ‘you won’t make it on your own’ from various people before I could officially leave. There were tears and sleepless nights wondering if they were right but I just knew that this corporate world wasn’t for me. I wanted crazy bright jumpers, not blazer jackets. I wanted to work on projects that stretched my imagination, not ones where I had to stick to strict rules. I wanted to learn and improve with every design, not feel like I was doing the same thing over and over. I worked on my education, filling any gaps so that I could offer a better design service, and I developed my brand and business to build Amber Phillips Design up to what it is today, tearing down the rules and just doing what feels right. Now I help small creative businesses and entrepreneurs like me, who want to stand out from the crowd and do their own thing for their own happiness, to get brilliant websites that match their brand personality and help them earn money to build the life they want. Travelling – I’ve been to some amazing places! Going to the cinema – I have an unlimited card! Not only is Amber a rockstar when it comes to creating websites, but she’s detail-oriented, organized, and efficient. Amber is amazing to work with and is now my go-to source for all website and design needs! I’ve created a free Facebook group where we can all hang out together as business owners. Do you sometimes feel a bit lonely, like no one understands your role as a small business owner? Do you sometimes get overwhelmed by all the information out there and you’re not sure what to listen to? Do you just want a bit of guidance on what to do next? Me too! I’ve joined some brilliant groups that have truly shaped my business journey (and helped me to triple my income!) and now I’ve started my own group. You’ll have me, a pro designer, right there in your back pocket, as well as a ton of other talented and beautiful entrepreneurs to help you drive forward in your business.